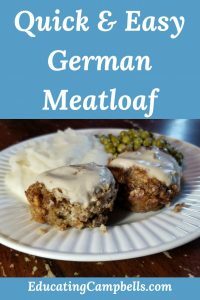 This recipe for quick & easy German Meatloaf is delicious. 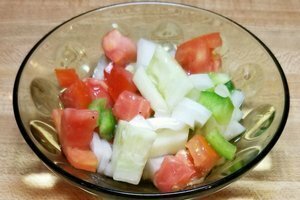 It’s another one of the few dishes I serve that everyone in my family loves. I love it because it’s rather quick to throw together and cook, and they love it because well, it’s good. I bake this delicious meatloaf in muffin tins to expedite cooking and make everyone a serving size piece. You, however, are welcome to bake yours in a loaf pan, if you choose. Just remember to adjust cooking time, probably to around an hour. Mix the ground beef, eggs, oats, one can cream of mushroom soup, and onion soup mix together in a mixing bowl. I do this by using my hands. It just seems to work better that way. Once it's all mixed well, still using my hands, I put large meatball-looking spheres into each cup of a muffin tin and smoosh slightly into the cups. These will cook for approximately 25-30 minutes, depending on your oven and how you like your meatloaf cooked. When the little loaves are almost done, spread a generous tablespoon of cream of mushroom soup onto each one. Bake for 5-10 more minutes. If this meatloaf seems a little to wet for your taste, you can always add more oats or take away some of the cream of mushroom soup. And for dessert, Mimi’s Quick & Easy Chocolate Chip Cookies!